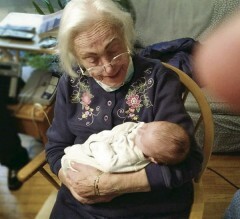 Miriam Turteltaub Miller, daughter of Dora Bloom Turteltaub 1919, holds new great-granddaughter Alexandra D. Eisenberg. Lexi was born Oct. 25 at Bethesda Naval Medical Center in Maryland and is the daughter of Lt. Cdr. Charles Eisenberg MD and Leah Myers Eisenberg. Dora was the first president of the first chapter of Sigma Delta Tau.